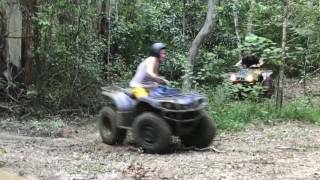 Get the best service and rates by dealing direct with Cairns Quads & Adventures. Limited on time, why not fit 2 great tours in 1 Day. Go Quad bike touring in the morning and then adventure out to the Reef in the afternoon for swimming and snorkelling. 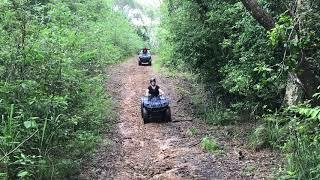 Your actual time on the quad bikes is around 1.5 hours, You will be given a short introductory training briefing and practice before venturing into the Rainforest, where the fun begins. This is where you’ll get to experience adrenalin pumping and exciting bumps and creeks crossings and adventures throughout your tour. You’ll get to experience the Rainforest up close and personal with plenty of stops of your adventure through the Rainforest. Our tours are always unique and memorable, and are fun in the sun and awesome in the wet! We also offer morning or afternoon tea, where you can sit down and have a chat about your Quad bike experience before returning to your accommodation. (Quad location is only ½ from Cairns) and we have an option of being dropped off at the airport for your departure flight. Our minimum age is 16 years old. 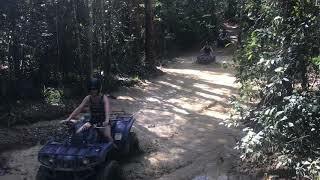 Your actual time on the quad bikes is around 1.5 hours, You will be given a short introductory training briefing and practice before venturing into the Rainforest, where the fun begins. This is where you’ll get to experience adrenalin pumping and exciting bumps and creeks crossings and adventures throughout your tour. You’ll get to experience the Rainforest up close and personal with plenty of stops of your adventure through the Rainforest. Our tours are always unique and memorable, and are fun in the sun and awesome in the wet! Our tours operate twice daily and include pickup and drop off and morning/afternoon tea, plus more. starting from only $150 per person. 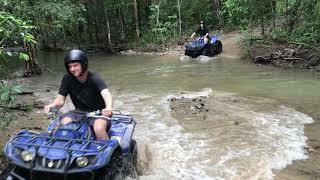 Cairns Quads & Adventures offers you our 1/2 Day Rainforest Quad tours, where you will get to experience our exciting tour, where we travel through the Rainforest on dirt tracks and through creek crossings. We have this fantastic Skyrail Rainforest Cableway or Train packages in 1 day. 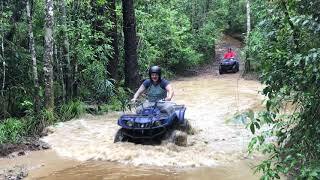 Travel to Kuranda on Skyrail or Scenic Train and then get off road on our Quad Bike tour. 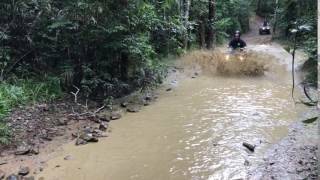 On this tour you travel to Kuranda on Scenic Railway and then enjoy beautiful Rainforest and experience riding quad bikes off road. Transfers included from Cairns, Palm Cove & Trinity Beach. Escape the city and explore the stunning rainforest surrounding tropical Cairns! Get your hit of adrenaline as you jump on your ATV Quad bikes and head off on dirt tracks through the bush and creek crossings! 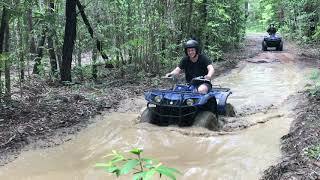 Cairns Quads & Adventures offers you our 1/2 Day Rainforest Quad tours, where you will get to experience our exciting tour, where we travel through the Rainforest on dirt tracks and through creek crossings. Our tours operate twice daily and include pickup and drop off and morning tea, plus more. Our tours are always unique and memorable, and are fun in the sun and awesome in the wet! We had a great morning on the bikes. We were well equipped and trained before we started. We had some time in a practice area that got us comfortable being off road. Then we started the trail which was a great combination of fun and challenging. There were creeks, hills, rocky sections, and smoother sections. I recommend using the rain coats (if it's raining or not) because you'll get wet from going through the creeks.It was great to be picked up from our accommodation and the kangaroos on the property were adorable! Thanks guys for a fantastic experience. Our guide, Nikki, shared her local knowledge so we could try out more fantastic experiences in the Cairns region. The ATV tour was so much fun, relaxing yet quite challenging at times. Most of our group had ridden bikes before and still felt we got a lot out of the ride. Thankyou for a terrific morning. Had an amazing time quad biking through the Rainforest! I didn't have any prior experience and Nicky guided us through really well! Would come back and do more quad biking! We were feeling a bit flat arriving in Cairns after a grand week in Sydney however our faith in the area was soon restored after taking this trip. Nicky picked us up from our hotel at a pre-arranged time and transported us to the Sky Rail terminal. We had an open ticket for the Sky Rail with an agreement to meet Nicky in Miranda at 2pm. This gave us plenty of time for a coffee and spending spree in the gift shop! The Sky Rail was a great experience, we shared a gondola on the first leg and the views were magic. Shame there is no audio commentary though. We arrived at the first stop and did a short board walk locally then made our way back to the Sky Rail. Little tip if you want a gondola to yourself make sure there are family group in front and behind you. Second leg took us to Barron Falls, there we took another board walk. The falls were a bit lacking in the water department but we took some nice pics. Leg three of the Sky Rail took us to Kuranda, keep smiling as you pull into the station as there is a camera taking pictures! Once at Kuranda you want to make your way into the village centre. This is best done via the free courtesy bus which drops you at the butterfly sanctuary. We had 3 hours to explore the markets, shops, get something to eat and see the wonderful butterfly sanctuary. Nicky picked us up outside at 2pm. Next for the exciting part. My wife and I were both quad virgins however we were made to feel at ease by Nicky. We were taken through all aspects of the bike and safety was obviously paramount. There was only the two of us plus Nicky on this session so we were able to set our own pace. I decided to follow behind the wife mainly so that I could laugh at her mistakes! We spent some time on a practice course to gauge our ability before heading off into the forest. We went through some challenging stages, some really fun stages and some really wet bits! If you wear shorts try to keep your legs away from the engine on the deeper water sections as they kick off some serious steam! We stopped as often as needed to take photos and the guide is more than happy to take a lead from you with regard pace, photo opportunities and what you want to get out of it. Upon returning to the paddock we were treated to a cold drink and 'home made' banana cake and just sat chatting to Nicky for ages, she showed a real interest in what we were discussing and made us feel like friends. This was a real personal experience. On the way back to the hotel we were given great advice on local things to do along with a stop off to take some photos. I do not think this company could have done anymore for us.... So if you fancy a really great full day out in Cairns then give this a try, you will not be disappointed. I made a brief stop in Cairns to dive the reef before heading back from vacation, and needed an excursion to fill an afternoon. 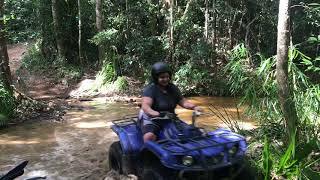 Quad bikes in the rainforest was AWESOME! And it really does RAIN there. Nicky was great, and provided a lot of information about Cairns, and provided an awesome Quad adventure. I've done quad biking before, but this was definitely more challenging and more fun! You'll be sure to get a little wet and muddy, but that made it twice as fun! I high recommend riding with Quads & Adventures! We had a great experience with Nicky. She collected us in Cairns and brought us to the ATV-TOUR site close to Kuranda. We had a great tour through the rainforest and some tricky passages, which added lots of fun. Superb adventure. Nikki was excellent, accurately assessing skill levels and tailored the tour to suit. We’ve done quads before where it was all a bit tame and boring. This wasn’t either and SO SO NICE to be sent some pics and not to be offered the chance to purchase overpriced ones. 10/10. had an fantastic time and enjoyed every second of it. 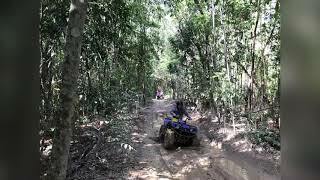 From the safety briefing and practice run to riding through the challenging terrain of the rainforest, mud pits, learning about the flora and fauna. Nicky is an excellent guide and loves what she does. Thanks Guys, I will be back!! just had a great moment in the forest with this tour where we passed in the water with the machine !!!! worthy !! Nicky was veey knowledgeable and explained the bikes fully. There was a practice area at the start of the tour. She pointed out wildlife and scenery along the way. Very friendly. Would recommend for anyone over 16 regardless of prior experience. Great afternoon on the ATV’s with Nicky. This was our first time initially we were cautious however we soon got the hang of it and were zooming through the puddles and up and down the steep hills. Thanks Nicky we had a great time. 16 y.o. teenage son and I had a fantastic time yesterday quad biking through the rainforest with tour guide Nikki. Morning group was not as busy as the afternoon so it felt like a private tour. Clear safety briefing. Ride was quite challenging and tested our newfound abilities. Would recommend as an adventurous activity for those so inclined.